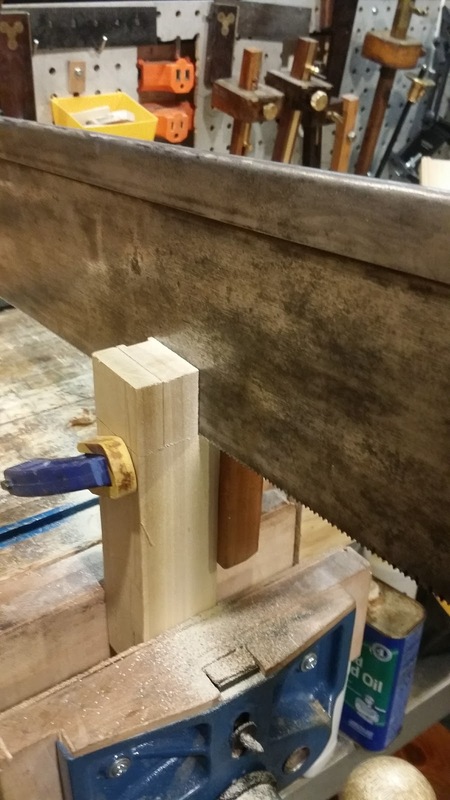 For those that never use miter boxes and like to freehand all of their saw cuts, skip this one. 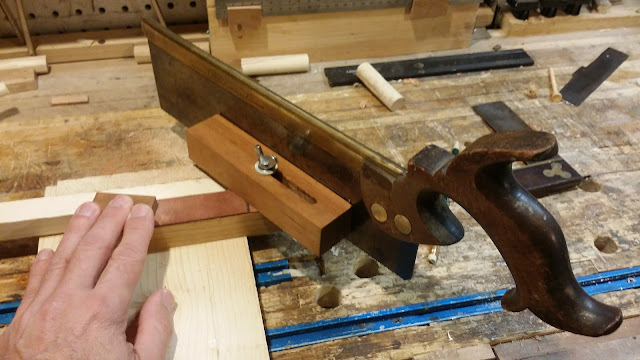 I have ditched my electric miter saw and prefer to use my Stanley No. 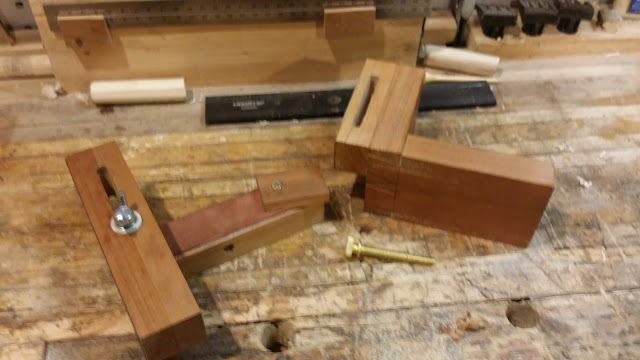 60 miter box to make cross cuts. 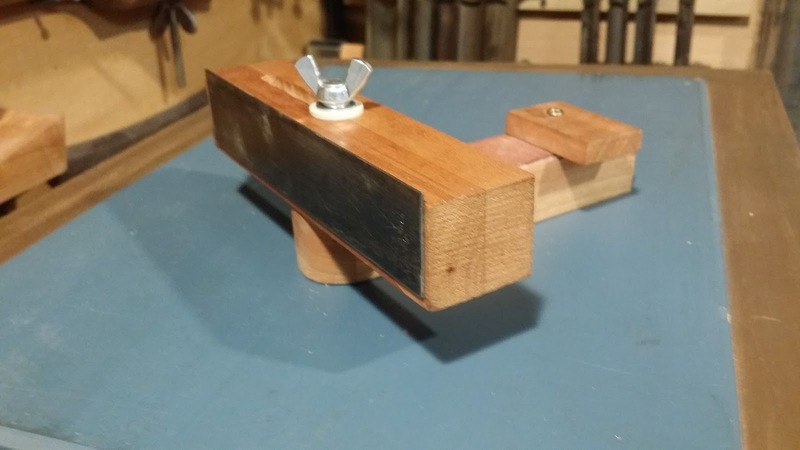 I used to pull out the miter box from under the bench and then set it up on the bench. 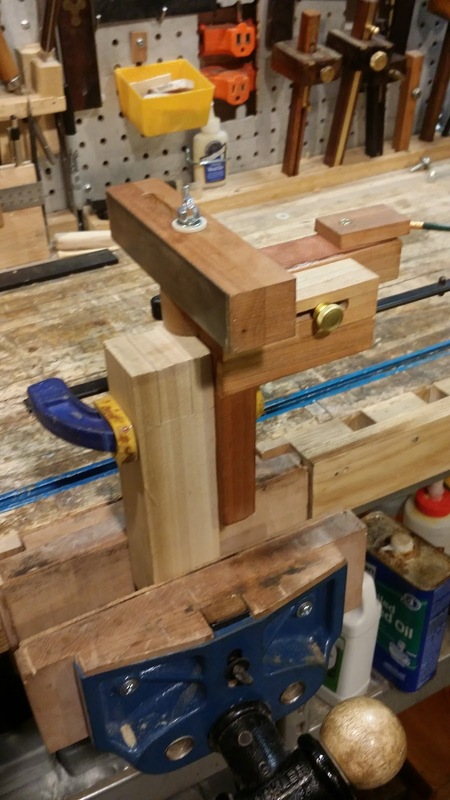 Unfortunately, the bench was often cluttered leaving no space for the miter box to be set up in the tiny workshop. 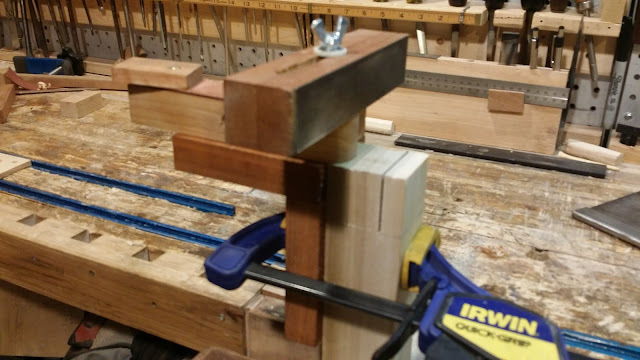 So, I left the miter box set up on a Black and Decker Workmate in the garage, adjacent to my basement workshop, making frequent walks back and forth. 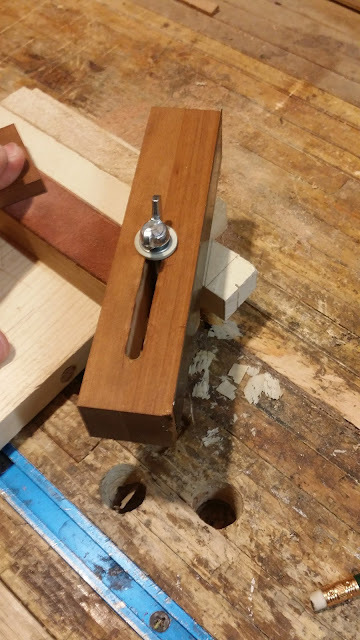 After logging in too many extra paces on my fit bit, I had to come up with a miter box that I could have on my bench. This portable solution for accurate cross and miter cuts uses a magnetic guide block attached to a fence that can be set up at any angle. 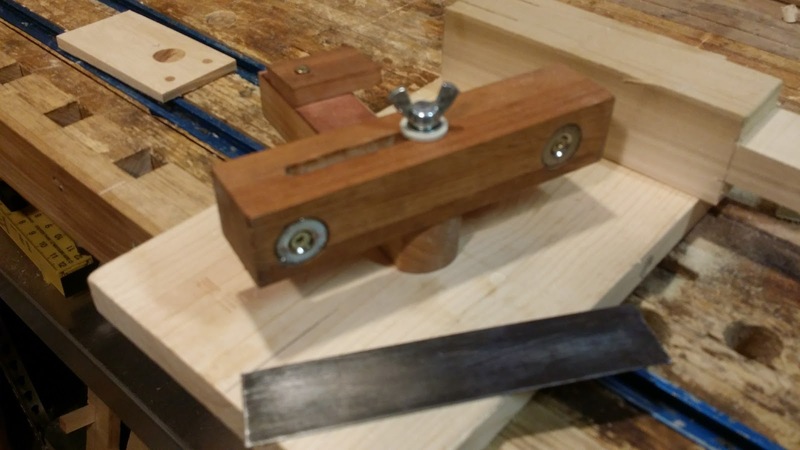 It is roughly based on the design of a bevel gauge. It is made from some scraps of wood I carefully pulled from my lifesize Jenga pile. 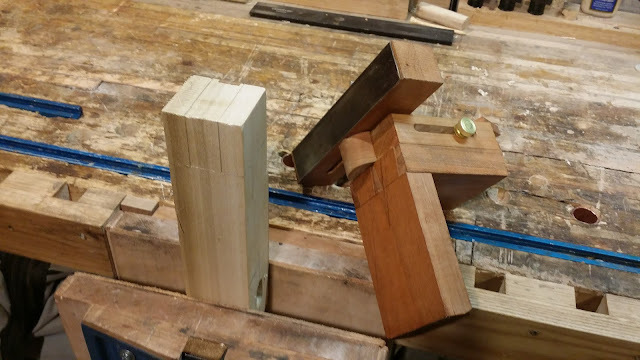 The bonus was that it helped me figure out a method to use the guide for accurate rip cuts, especially helpful for cutting the cheeks of a tenon. 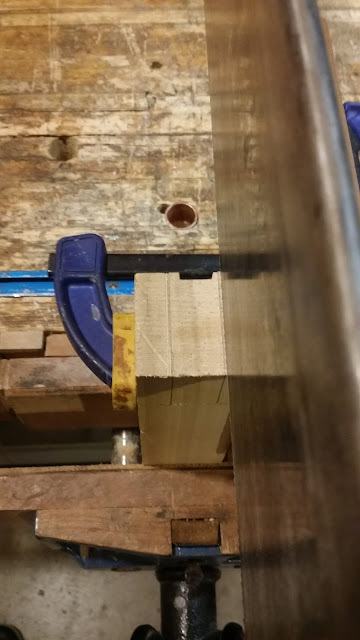 3/4" diameter x 1/4" thick countersunk Nd magnets. The wing nut bolt (1/4" diameter, 2" length) screws into a threaded insert in the lower block. The guide is meant to be used with a bench hook. 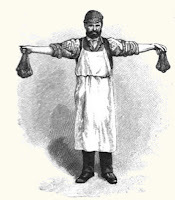 The small block on the left side of the device is turned 90 degrees when cutting thicker stock so that the device stays level. The leather strip helps secure the two blocks together. 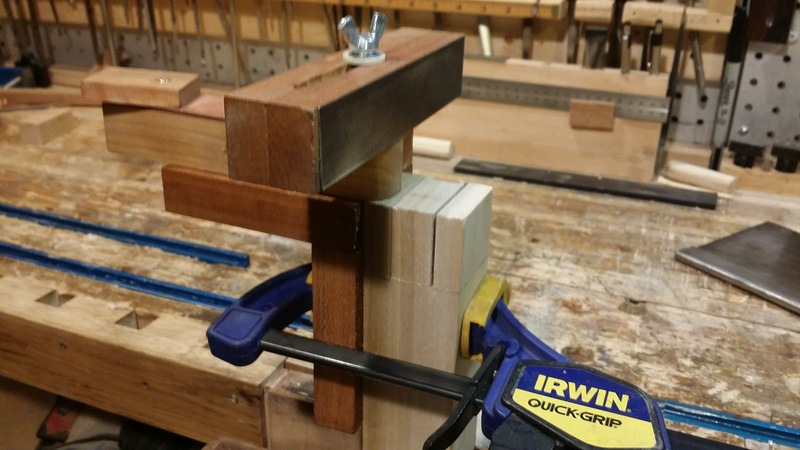 The magnetic "miter box" is attached to the 90 degree fence with two 7/8" pieces dovetailed together. The brass bolt, when loosened, allows the magnetic fence to move in or out. The 90 degree fence is put together via dovetails. 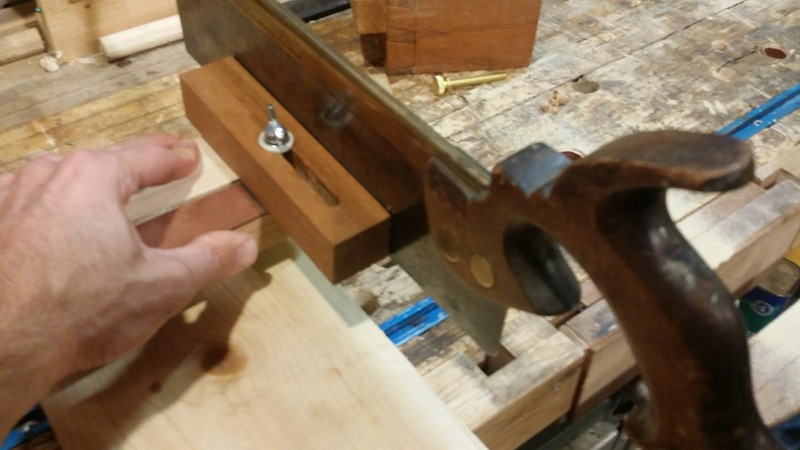 The brass bolt goes through the slot (seen above the bolt) which then screws into a threaded nut on the fence of the magnetic guide. This allows the guide to be adjusted for width of teneon cheek. This isn't the first SCAM (Saw Cut Assisted with Magnets) that I have used. 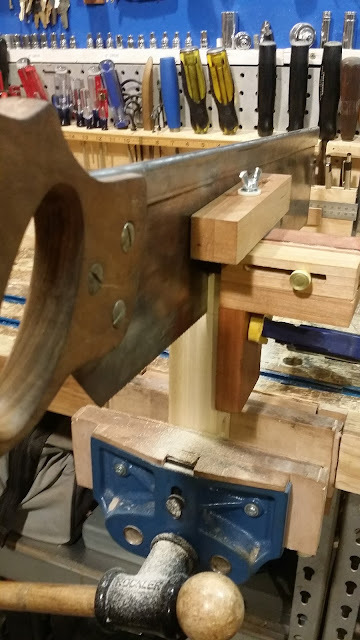 There was the magnetized rear end of a miter jack, which I use quite a bit, as well as the Veritas saw guide. 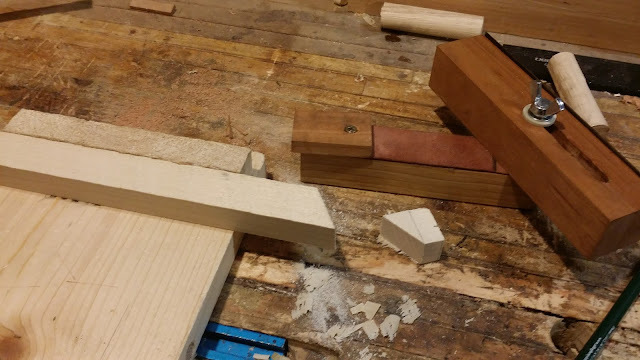 I still freehand many cuts, sometimes followed by a shooting board. But when a cut is critical, trust the SCAM. Oh well, at least this one combines two good ideas. I'm sure that I'm not the first one to have "come up with something on my own" only to find out it already exists.